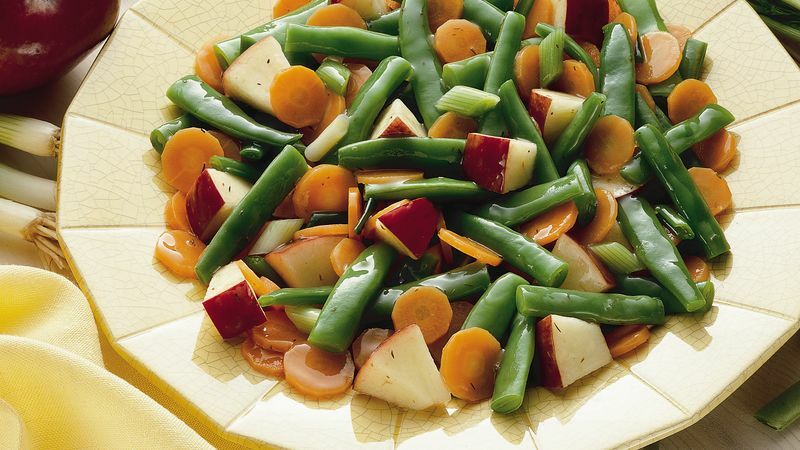 In large saucepan, combine green beans, carrots, onions, water, sugar, salt and thyme; mix well. Bring to a boil. Reduce heat to low; cover and simmer 5 to 7 minutes or until vegetables are crisp-tender, stirring occasionally. In small bowl, combine apple juice and cornstarch; blend well. Stir cornstarch mixture into cooked vegetables. Add apple. Increase heat; cook and stir 1 to 2 minutes or until sauce is bubbly and thickened.